Work Folders which is the feature that was released with Windows Server 2012 R2 and Windows 8.1 is a “OneDrive” like feature that allows users synchronise their “work” files on their devices. The key difference with this feature is that the files are stored on premise on the back end instead of the cloud which is far more palatable for companies that are still nervous about moving to the cloud. Originally this client for this feature was for Windows 8.1 and then it was released for Windows 7 with promise that an iPad version of the app would be coming soon. Well, finally Microsoft have made good on this promise and they have now released the iPad. What is really great about this release is that it now makes the Work Folders feature a truly cross platform feature. But more importantly it enables your iPad loving managers that seem have their Apple device surgically attached to the hand actually do “work” on their tables. Why is this even important you ask? Well, most workplaces are of course political and managers are normally the people you need to win over to get anything approved. Another added advantage of this feature is that the licensing is also included with Windows (you mileage may vary). So this is also a much cheaper alternative to solution like Box.com which also offers synchronisation cross platform but at a per user cost to the business. Finally the iPad version of the app also offline support and encryption to ensure that the information in the app is always secure. 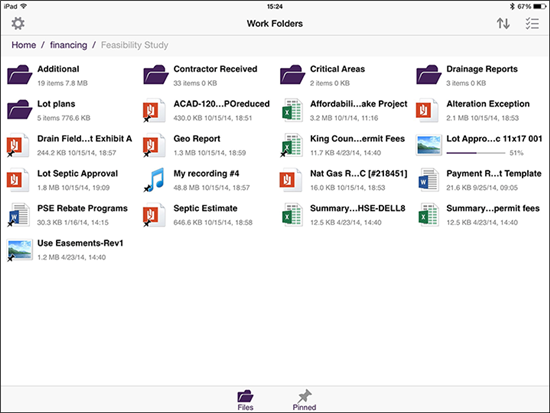 So, if you have already got Work Folders deployed in your organisation then download the app and get started. But, if this is the first time you have heard about this feature and you are still after more information then I suggest you check out my many other blog post here or even my TechEd 2013 and TechEd 2014.